JOHN F. WALVOORD (A.B., D.D., Wheaton College; A.M., Texas Christian University; Th.B., Th.M., Th.D., Dallas Theological Seminary), former president of Dallas Theological Seminary and editor of Bibliotheca Sacra, America’s oldest theological quarterly, was recognized as one of the leading evangelical theologians in America and an authority on systematic theology and eschatology. His academic background and extensive travel in the Middle East made him unusually capable of preparing theological and eschatological studies. He authored numerous books on theology and biblical prophecy, including The Revelation of Jesus Christ, Jesus Christ Our Lord, and Daniel: The Key to Prophetic Revelation. Matthew 24 is a crucial passage in the debate between pre- and posttribulationists. The context of Matthew 24 and especially vv 40–41 argues that a posttribulational rapture is not being taught. Rather Christ, on the analogy of Noah’s flood, spoke of some being taken in judgment. Thus it can be concluded that no biblical text places the rapture after the tribulation (The article below is adapted from the Grace Theological Journal [Fall 85], p.258ff). Among premillenarians, the question as to whether the rapture of the church occurs before or after the end time tribulation continues to be a live subject for debate. 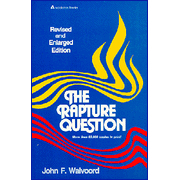 Among other eschatological points of view such as postmillennialism and amillennialism, it is assumed that the rapture is a part of the second coming of Christ and therefore is posttribulational. Postmillenarians and amillenarians accept almost without question a posttribulational rapture because they interpret prophecies of the events leading up to the second coming nonliterally. By contrast premillenialism depends upon a literal interpretation of prophecy. Among premillenarians, however, the issue of pretribulationism continues to be discussed, and books continue to be published on the issues involved. The differences of opinion stem largely from the question as to whether end time prophecies are to be interpreted literally, especially as they distinguish Israel’s future from that of the church, the body of Christ. Both pretribulationists and posttribulationists are confronted with the fact that the Scripture does not expressly state either view. Pretribulationists find what approximates a direct teaching of their view in 2 Thessalonians 2 where the lawless one is said to be revealed only after the restrainer is removed. The traditional interpretation among pretribulationists is that the restrainer is the Holy Spirit who indwells the church. Thus, it is the Holy Spirit (and by implication the church) who must be removed before the lawless one can be revealed (E.g., see D. Edmond Hiebert, The Thessalonian Epistles [Chicago: Moody, 1971] 313-14; J. Dwight Pentecost, Things to Come [Grand Rapids: Zondervan, 1958] 259-63; and John F. Walvoord, “Is the Tribulation before the Rapture in 2 Thessalonians,” BSac 134 107-13). If the lawless one is the end time ruler, he would be revealed at least seven years before the second coming of Christ. According to this interpretation of 2 Thessalonians 2, then, the rapture occurs prior to the tribulation. Posttribulationists, of course, dispute this interpretation and interpret the passage in a manner that does not yield a pretribulational sequence of end time events (E.g., see Robert H. Gundry, The Church and the Tribulation [Grand Rapids: Zondervan, 1973] 122-28. For a recent discussion of the passage from pre-, mid-, and posttribulational perspectives see Gleason L. Archer, Paul D. Feinberg, Douglas J. Moo, and Richard D. Reiter, The Rapture: Pre-, Mid-, or Post-tribulational? [Grand Rapids: Zondervan, 1984] 126-27,189-90,228-29. What is often overlooked in the discussion by posttribulationists is that they also lack a specific statement that the rapture of the church occurs at the time of Christ’s second coming to set up his kingdom. It is quite common for posttribulationists to challenge pretribulationists to offer a single verse in the Bible that teaches their position. Pretribulationism counters by offering passages that imply it, such as 2 Thessalonians 2. Pretribulationists also point out that all the passages clearly identified as referring to the rapture name no preceding events. On the other hand, passages dealing with the second coming of Christ to set up his kingdom predict a complicated series of world-shaking events such as are described in Revelation 6–18 and other passages dealing with the end time. Posttribulationists are also embarrassed by the fact that the most detailed account of the second coming of Christ, found in Revelation 19–20 , nowhere mentions either a rapture or a resurrection in connection with Christ’s coming from heaven to earth, and there is no legitimate place to insert the events of 1 Thessalonians 4. Accordingly posttribulationists recognize the need for a specific passage that will support the posttribulational view. This for many posttribulationists is found in Matthew 24. This chapter of the Bible, therefore, becomes a strategic crux interpretum in the debate between the two views. Those who hold a midtribulational view, that is, that the rapture will occur three and one-half years before the second coming of Christ, also turn to Matthew 24. The discussion of this portion of Scripture and its proper exegesis, therefore, becomes quite determinative in any conclusion as to where the rapture fits into the prophetic scheme. Practically every author who attempts to refute the pretribulational view discusses in some detail Matthew 24 in an effort to find support for posttribulationalism (E.g., see Gundry, The Church and the Tribulation, 135–39, 158; George E. Ladd, The Blessed Hope [Grand Rapids: Eerdmans, 1956] 144-45; and Alexander Reese, The Approaching Advent of Christ [London: Marshall, Morgan, and Scott, 1932] 29, 208, 214-15). As the Gospels make clear, the Olivet Discourse, contained in Matthew 24–25 , occurred only days before the death and crucifixion of Christ. Opposition to Christ and efforts to kill him on the part of religious leaders of the day intensified as the time approached for the death and crucifixion of Christ. All of this troubled the disciples because it did not fit into their expectation that Jesus Christ was their Messiah and Savior, the Son of God, who would deliver them from the oppression of the Roman Empire. They were further troubled by Christ’s own statement that he was to die by crucifixion. This had been implied in his comparison of his own death and resurrection to the experience of Jonah (Matt 12:38–41). Then he had explicitly predicted his death and resurrection three times as recorded in all three Gospels (Matt 16:21; 17:22–23 ; 19:18–19 ; Mark 8:31–33; 9:30–32 ; 10:32–34 ; Luke 9:22; 9:43–45 ; 18:31–34 ). These predictions did not harmonize with the disciples’ expectation that Christ would deliver Israel from the oppression of Rome. The disciples were further disturbed by Christ’s denunciation of the Pharisees (Matthew 23) when he pronounced seven woes upon them. He denounced them as hypocrites, as whitewashed tombs, and as vipers. He closed his denunciation with the reminder that their forefathers had killed the prophets God had sent them. Accordingly, because they rejected Christ, Jerusalem would also be left desolate. These prophecies did not fit in with the anticipation of a glorious kingdom on earth in which Christ would reign. It was in this context that the disciples reminded Christ of the beauty of their temple, the symbol of their religion and national solidarity. Here again they were dismayed when Christ announced “not one stone here will be left upon another; every one will be thrown down” (Matt 24:2). Things came to a head after Christ had crossed the brook Kidron with his disciples and had stopped on the western slope of the Mount of Olives. It was then that the inner circle of the twelve disciples (Peter, James, John, and Andrew, according to Mark 13:3) came to Christ privately with three major questions (Matt 24:3). These questions were (1) “when will this happen,” (2) “what will be the sign of your coming,” and (3) “(what will be) the sign…of the end of the age”? The first question, referring to the destruction of the temple, is answered in Luke 21:20–24 by a prophecy which was fulfilled in the destruction of Jerusalem in A.D. 70. Matthew does not record Christ’s answer to the first question but does record the answers to questions (2) and (3) which both deal with the second coming of Christ. At this time the disciples did not understand the difference between the first and second coming of Christ. What they were really questioning was, what were the signs of the approaching kingdom? Their questions were prompted by their attempt to harmonize in some way the OT prophecies of the Messiah’s death and resurrection with the promises of his glorious reign and the deliverance of Israel. It is most significant that saints in the OT (including the writers of Scripture [1 Pet 1:10–12]) as well as the twelve disciples in the NT never understood clearly the difference between the first and second coming of Christ. It was only after Christ’s ascension into heaven that the distinction was made clear. With the help of historical hindsight, today the difference between the first and second coming of Christ can be sorted out because in the first coming of Christ the prophecies relating to his birth, life on earth, miracles, death and resurrection were all literally fulfilled while the prophecies of his glorious kingdom reign still await future fulfillment. If major events like the first coming and second coming of Christ could be so mingled in the OT and even in the Gospels, it is not surprising that there should be confusion today between a pretribulational rapture and a second coming of Christ to set up his kingdom. However, in contrast to the universal confusion of the first and second coming of Christ prior to Christ’s ascension, many students of prophecy today firmly believe that the rapture of the church will be pretribulational. They do this on much the same grounds that the first and second coming of Christ are separated today—that is, they distinguish the two events because they are so different in many characteristics, including the events which precede the event itself, and the events which follow. Taking all the facts available, it can be determined that the setting for the questions of the disciples was that they did not know how to harmonize events relating to the first and second coming of Christ. It is to this crucial question that Christ gave the answers recorded in Matthew 24–25. An examination of major commentaries on Matthew 24 demonstrates that there is disagreement as to what the passage really teaches. Conservative scholars who accept a literal second coming of Christ are usually united in their interpretation that the passage in general refers to the second coming of Christ. This is because the passage is very explicit. The events described will climax in Christ’s coming as stated by Christ himself—”they will see the Son of Man coming on the clouds of the sky, with power and great glory” (Matt 24:30). The confusion arises in interpreting what Christ said about events leading up to the second coming. G. Campbell Morgan divides the Olivet Discourse into three divisions. He considers Matt 24:5–35 to be talking about Israel. He relates Matt 24:36–25:30 to the church “as the spiritual Israel of God.” He interprets Matt 25:31–46 as a judgment that Christ pronounced on the nations (G. Campbell Morgan, The Gospel According to Matthew [New York: Revell, 1929] 284). He holds that Matt 24:6–22 was fulfilled in the fall of Jerusalem, but in his exegesis he skips almost completely the problems of interpretation that exist in Matt 24:1–44. Robert Gundry illustrates the posttribulational interpretation of this passage. He directs attention away from the subject matter to the hypothetical question, “To whom is the passage directed?” He writes, “To what group of redeemed do the Jewish saints addressed by Jesus and represented by the Apostles belong, Israel or the church?” (Gundry, The Church and the Tribulation, 129). In his complicated answer to this problem, he needlessly misdirects attention. This point of view is adopted by other posttribulationists and midtribulationists. They also insert the hypothesis that the prophecies had to be fulfilled in the lifetime of the apostles—an erroneous approach since the second coming of Christ and the course of the entire preceding age is predicted. The disciples were both Jews and the initial members of the church, the body of Christ. The answers to their questions concerned anyone who was interested in the events of the end of the age, and they are not limited to the apostolic age. While the disciples obviously were interested in how this related to the Jews, as illustrated by their questions, the answer that Christ gave is largely non-Jewish. It involves prophecies which affect the whole world with the Olivet Discourse specifically concluding with the judgment of the Gentiles. The issue at hand is not to whom Christ’s answer is addressed, but the question of the content of the prophecy itself. Gundry never even mentions the three questions that are being answered in this discourse of Christ. A typical amillennial interpretation is offered by R. C. H. Lenski. He holds that many of the prophecies of this passage, including the great tribulation, have already been fulfilled in connection with the destruction of Jerusalem and the events which preceded it. In general he finds that the prophecies are largely fulfilled already historically, but that they obviously lead up to the second coming of Christ. He does not consider the question as to whether the subject of the rapture is being presented. Everything is related to the second coming of Christ as far as the consummation is concerned (R. C. H. Lenski, The Interpretation of St. Matthew’s Gospel [Minneapolis: Augsburg, 1943] 956). The great variety of opinions on Matthew 24 indicate that this passage is difficult to interpret. The present discussion will focus on the contribution of Matt 24:31 and Matt 24:37–42 toward understanding the time relationship between the rapture and the tribulation. At that time the sign of the Son of Man will appear in the sky, and all nations of the earth will mourn. They will see the Son of Man coming on the clouds of the sky with power and great glory. And He will send His angels with a loud trumpet call, and they will gather His elect from the four winds, from one end of the heavens to the other [Matt 24:30–31]. Among conservative interpreters of Scripture, there is general agreement that this prophecy concerns a gathering of the elect in connection with the second coming of Christ. Some premillenarians limit the “elect” to the Jewish people because Christ is addressing the apostles in this passage. Others view the “elect” as including all the saved, whether OT or NT saints. Premillenarians, whether pretribulational or posttribulational, recognize that there will be a gathering of all the saints at the time of the second coming of Christ in order that they may all participate in the millennial kingdom. Amillenarians would agree with this, but they would add the resurrection of the wicked as indicated in Rev 20:11–15. Postmillenarians would have essentially the same view as the amillenarians. The major question raised by premillenarians, whether pretribulationists or posttribulationists, is whether this event includes the rapture of the church. Even if the church is raptured earlier in the sequence of events, it nevertheless would be included in this gathering. The two essentials of the rapture of the church are resurrection of the dead in Christ and translation of living Christians, as brought out clearly in central passages such as 1 Thess 4:13–18 and 1 Cor 15:51–58. The prophecy in Matthew, however, says nothing of either resurrection or translation and refers only to the gathering of the elect. It may be assumed that the elect so gathered have been either translated or resurrected, but it is not indicated when this occurs. Accordingly the passage cannot properly be used by either the pretribulationists or the posttribulationists as positive proof of their position, although the silence relative to resurrection and translation here would be in favor of the pretribulational position. Most of the attention between pretribulational and posttribulational arguments, however, has centered on Matt 24:36–42. Here the time factor is specifically discussed. Christ states, “No one knows about that day or hour, not even the angels in heaven, nor the Son, but only the Father” (Matt 24:36). This presents a problem for all eschatological views in that Christ states that he does not know the day or the hour, but that only the Father knows. Christ is emphasizing that the time has not been revealed. If Christ did not know it, neither can anyone else. In the interpretation of end time prophecy, many premillenarians hold that the last seven years referred to in Dan 9:27 will culminate in the second coming of Christ. Even if prophetic years of 360 days are used, it is not clear what day or hour will actually signal the second coming of Christ. The final period of great tribulation leading up to the second coming of Christ is defined as one-half of the last seven years in Dan 9:27. In Dan 7:25 and 12:7 the expression “a time, times and half a time” is usually interpreted as three and one-half years. The same expression occurs in Rev 12:14. In Rev 13:5 the period is referred to as forty-two months. In Dan 12:11–12, the period is described as 1290 and 1335 days. Here the forty-two month period is extended thirty and seventy-five days to uncertain termini. While all of these should be interpreted as literal time periods, they do not reveal the day or the hour of Christ’s return. Expanding on the uncertainty of the day and the hour, Christ declares it will be like the days of Noah (Matt 24:37). While Noah was building the ark, it was obvious that the flood would not come until he had completed the project. Once the ark was completed the situation changed radically. As observers saw the animals going into the ark by two in a manner contrary to nature, it was obvious that this was a sign that something was about to happen. But the day or the hour still was not clear. Then as they observed Noah’s family enter the ark and the door shutting, they still could not know the day or the hour, but it was obvious that the flood could come at any time. Because of the uncertainty of the time of the flood and their skepticism as to whether the flood was even going to occur, Christ describes them as continuing in the normal course of life “eating and drinking, marrying and giving in marriage, up to the day Noah entered the ark” (Matt 24:38). Christ goes on to say that when the flood came it “took them all away” (Matt 24:39). The similarity of this to the rapture of the church has caused many expositors, especially posttribulationists, to liken this to what will take place at the time of the second coming. Alexander Reese, whose major work is The Approaching Advent of Christ, cites these verses as proof that the rapture occurs in connection with the second coming of Christ. His book, on which he spent twenty-five years, has been the regularly-cited classic work on posttribulationism ever since it was published. There is a major problem, however, with this interpretation. In the illustration of the flood which Christ himself used, the one who is taken is drowned whereas those who are left, that is, Noah’s family, are safe in the ark. To view the one taken as the righteous one and the one left as the judged one is to reverse the illustration completely. Darby, in one of the few instances where he allowed views to influence (and mar) his admirable literal translation, translated paralambanō in Luke xvii:34–5 by seize. The use of this word in the NT is absolutely opposed to this; it is a good word; a word used exclusively in the sense of ‘take away with,’ or ‘receive,’ or ‘take home.’ (Reese, Approaching Advent, 215). Reese and others have pointed out that παραλαμβάνω is used of the rapture in John 14:3. This is an illustration, however, that even a careful scholar may make mistakes. Reese evidently failed to check John 19:16 (“the soldiers took charge of [παρέλαβον] Jesus”), where “took charge of” is hardly a reference to a friendly taking. As a matter of fact, it refers to taking Christ to the judgment of the cross. But granting that the context indicates judgment, we are not forced to conclude that ‘one will be taken’ in judgment and ‘one will be left’ in safety. The reverse may just as easily be understood: ‘one will be taken’ in rapture and ‘one will be left’ for judgment (Gundry, The Church and the Tribulation, 138). However, the context completely contradicts Reese and Gundry. The context here is more determinative than the fact that the word παραλαμβάνω is used for the rapture in John 14:3 by a different author. Interestingly, after additional study, Gundry changed his mind. In his later work (Matthew) he reversed his opinion. He states, “But Matthew’s parallelistic insertion of airen in v. 39 , where judgment is in view, makes the taking judgmental in his gospel. Hence, being left means being spared from instead of exposed to judgment” (Robert H. Gundry, Matthew: A Commentary on His Literary and Theological Art [Grand Rapids: Eerdmans, 1982] 494). In other words, he concedes what he formerly refuted and agrees with the pretribulational interpretation of this passage. If there is any doubt as to the interpretation here, it should be settled by a parallel reference in Luke 17 where Christ, predicting the same event in the same context states, “I tell you, on that night, two people will be in one bed; one will be taken and the other left. Two will be grinding grain together; one will be taken and the other left” (Luke 17:34–35). Gundry also cites this passage but significantly stops before 37, which would have made the matter clear. Here the disciples asked the question, “Where, Lord?” Christ replied, “Where there is a dead body, there the vultures will gather.” It is clear that the ones taken are put to death. This actually is a preliminary stage of the judgment that is later detailed in Matt 25:31–46 where the unsaved Gentiles are destroyed. Posttribulationists and midtribulationists as well have misread the immediate context of Matt 24:40–41 and have reached an unwarranted conclusion that there is a rapture in this passage. Instead, the passage teaches that the righteous will be left as Noah and his family were left alive in the ark, whereas all others will be taken away in judgment. The argument for posttribulationism based upon this text, which even posttribulationists admit is the only passage approximating a direct statement of a posttribulation rapture, collapses upon careful analysis. Even Gundry has reversed his former view of this passage. The fact that those who are left, are left alive to enter the millennial kingdom because they are saved is further confirmed by Christ in Matt 25:31–46 where the sheep are ushered into the kingdom and the goats are cast into everlasting fire. This indicates the separation of the saved from the unsaved at the time of the second coming. There is no rapture at the second coming because those who survive the period after this purging judgment of God enter the millennium in their natural bodies so that they can fulfill the Scriptures that describe them as living natural lives, bearing children, living, dying, and even sinning. All of these factors would be impossible if every saved person were raptured at the time of the second coming. A careful study of the passage relating to the second coming of Christ in Matthew 24, therefore, gives no ground for a posttribulational rapture. In fact it confirms the concept that those who are caught up at the rapture are caught up to heaven to the Father’s house as Christ promised in John 14. This will occur at a time preceding the events of Matthew 24–25 which must be fulfilled prior to the second coming of Christ. The rapture therefore is an imminent event which today may be expected momentarily. in judgment. The argument for posttribulationism based upon this text, which even posttribulationists admit is the only passage approximating a direct statement of a posttribulation rapture, collapses upon careful analysis. Even Gundry has reversed his former view of this passage. 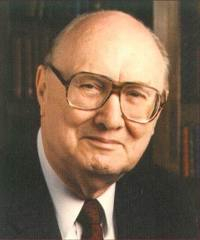 John Flipse Walvoord, theologian, writer, and teacher, seminary president, and defender of dispensational pretribulational premillennialism, was born on May 1, 1910, in Sheboygan, Wisconsin. He was the youngest of three children. John was raised in a home that valued education in general and religious training in particular. His father, John Garrett Walvoord, was a school teacher. During his mother Mary Flipse Walvoord’s difficult pregnancy, her doctors advised an abortion; however, because of their conviction that the child was a gift from the Lord, they brought John to term. The child proved to be robust, and Mary lived to be 102. The family were members of the First Presbyterian Church, his father an elder and Sunday school superintendent. His parents determined that their children would be reared on the Westminster Shorter Catechism and Scripture memory. When John was fifteen, the family moved to Racine where his father was a junior high school superintendent. During his high school years, John excelled in academics and athletics but continued to have only a nominal interest in Christianity, although he had committed his life to Christian work when he was twelve. His family joined the Union Gospel Tabernacle (now the nondenominational Racine Bible Church). While attending a study of the book of Galatians, he became assured of God’s mercy toward him. Three years later (1928), he entered Wheaton College. John continued to excel in academics and athletics, though he also distinguished himself as a member of the debate team that won state championships in 1930 and 1931. Additionally, he was president of the college’s Christian Endeavor where he made a commitment to foreign missions. He completed his undergraduate degree in 1931 with honors having accelerated his progress due to summer school work at the University of Colorado. He married Geraldine Delores Lundgren in her hometown of Geneva, Illinois. Geraldine was the fifth of six children born to native SwedesGustaf Edward Lundgren and Emily Skoglund. John accepted the invitation to stay for dinner before traveling on to his parents’ home in Wisconsin and over the next several years more than a few letters and visits cultivated their friendship into a lifelong romance. 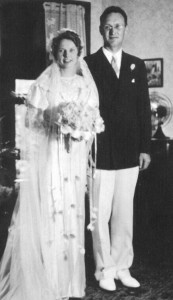 Deeply in love and convinced of God’s will for their lives, John and Geraldine were married on June 28, 1939. John graduated from Dallas Theological Seminary in 1934. He wanted to go to China as a missionary. At the time he couldn’t believe that everyone didn’t want to go to China. But the Lord had different plans for him. As he launched into his doctoral studies in Dallas in 1934, the young graduate was called to the Rosen Heights Presbyterian Church in nearby Fort Worth where he served as a pastor for sixteen years. Then in 1936 more responsibility came. He was asked to temporarily fill the position of registrar at the Seminary and in a short time he did much to organize and structure the office. In 1945, after nine years of faculty service, Dr. Walvoord was asked to assume the role of assistant to the president, a position he held until the death of Dr. Chafer seven years later. On February 6, 1953, John F. Walvoord was inaugurated as the second president of Dallas Theological Seminary. 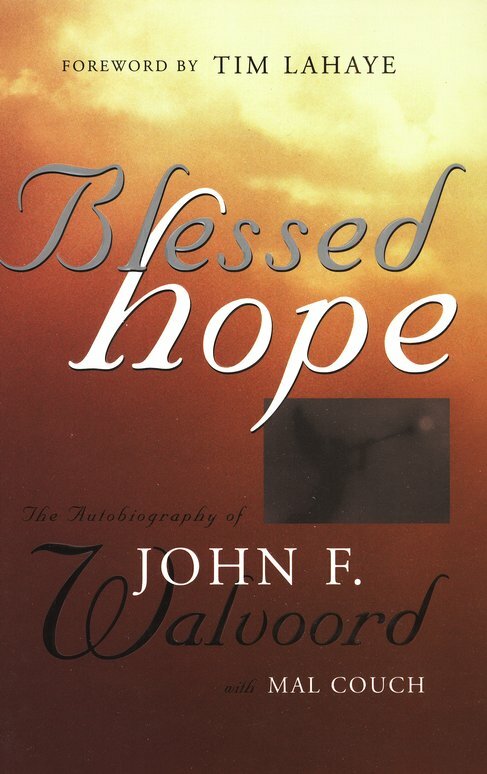 Dr. John F. Walvoord is considered perhaps the world’s foremost interpreter of biblical prophecy. He was a member of the Dallas Theological Seminary faculty for fifty years from 1936 to 1986. He served as president and professor of systematic theology at Dallas Theological Seminary from 1952 to 1986. He has served as chancellor at that institution since that time. He holds A.B. and D.D. degrees from Wheaton College; an A. M. degree from Texas Christian University; a Th.B., Th.M., and Th.D. from Dallas Theological Seminary; and a Litt.D. from Liberty Baptist Seminary. Under Dr. Walvoord’s leadership, Dallas Theological Seminary enrollment grew from 300 to over 1,700, four major educational buildings were erected on campus, and the degree programs increased from three to six. Dr. Walvoord is known worldwide for his evangelical scholarship in Christology, pneumatology (the doctrine of the Holy Spirit), and Bible prophecy. Dallas Theological Seminary, one of the world’s largest, is recognized for its commitment to the inerrancy of the Scriptures, premillennial theology, and biblical preaching and teaching. The Bible Knowledge Commentary* (co-editor of two volumes). Every Prophecy of the Bible* . One of the problems in theology today is that many people who refer to dispensationalism do not adequately understand its roots, and therefore they dismiss it without giving it due consideration. To understand the long background of dispensationalism, I examined approximately one hundred books on systematic theology to seek to determine how they explain dispensationalism. Most of these theologies in the nineteenth century were postmillennial, and most of the ones in the twentieth century were amillennial. They represented almost every system of theology, including liberal and conservative, Calvinistic and Arminian. Relatively few were premillennial. About half of them, regardless of their theological background, recognized biblical dispensations. One of the most significant was that of Charles Hodge, outstanding Calvinistic theologian of the nineteenth century, who was postmillennial in his eschatology but who wrote that the Scriptures describe four dispensations: Adam to Abraham, Abraham to Moses, Moses to Christ, and the Gospel dispensation. And Louis Berkhof, an amillenarian, wrote that the Bible has two dispensations. In the theological works that do discuss dispensations it is evident that acknowledging the presence of dispensations is not limited to a single theological system. Instead, such acknowledgement is based on progressive revelation, the fact that God continued to reveal Himself to humankind through biblical history. Dispensationalism is an approach to the Bible that recognizes differing moral responsibilities for people, in keeping with how much they knew about God and His ways. God’s revelation of Himself in different eras required moral responses on the part of humanity. In the Garden of Eden the only requirement for conduct was that Adam and Eve were to keep the Garden and not eat of the fruit of knowledge of good and evil. With the entrance of sin, human conscience came in as the guideline for conduct. It proved to be faulty, however, and people continued to sin. Following conscience there was the Flood and with it the introduction of the concept of government and the command that murderers be executed. This, however, also ended in failure at the Tower of Babel. The introduction of the Abrahamic Covenant in Genesis 12 and 15 presented a totally new perspective, as God revealed His special plan for Israel in the future. Then those dispensations or stages of progressive revelation were followed by the Mosaic Covenant. The Mosaic Covenant, the most extensive code of conduct to be found in the Old Testament, was given only to Israel. The nations were not judged by it. None of the nations, for example, were punished for not keeping the Sabbath. Each dispensation superseded the previous one, continuing some of the revelation and conduct requirements of the past and introducing new requirements as well as eliminating some requirements of the previous dispensation. This situation was similar to raising a child who in his early years was subject to a number of limitations but for whom some limitations, as he grew, were lifted while new ones were added. The New Testament introduces God’s plan and purpose for the church. The numerous requirements of the Mosaic Law do not apply to the present era because the present church age is a different dispensation. For instance, while the Law required executing a man for not keeping the Sabbath, no one would extend that requirement to the present day. In dealing with the legalism present in the Galatian church Paul stated that the Law was like a tutor to bring people to Christ. Just as an adult son no longer needs a tutor, so under grace believers no longer need the Law (Gal. 3:24-25; cf. 4:1-7 on the difference between the rules for children and the rules for adults). In the twentieth century many strides forward have been made in interpreting the doctrines of Scripture, especially eschatology and dispensationalism. In this area of theology The Scofield Reference Bible played a major part. Written originally by C. I. Scofield in 1909, he revised it in 1917. After World War I and after Scofield’s death in 1921 The Scofield Reference Bible became an unusually popular study Bible. The Bible conference movement became prominent in this country, and Bible teachers in those conferences often recommended The Scofield Reference Bible. As a result millions of copies were sold, and the views presented in that study Bible became the views of numerous Bible institutes and many evangelicals of the twentieth century. This situation changed after the 1930s and in the decade that followed. Many seminaries that were formerly orthodox had turned liberal. Then as their graduates were called to churches that were traditionally orthodox, clashes occurred between pastors and their congregations. If a pastor opposed the doctrinal convictions of his congregants, he would have to challenge the doctrine of inspiration, the virgin birth, and similar issues, and this would immediately cause his people to raise questions about his own theology. A number of pastors discovered that most of the people who opposed them were carrying Scofield Reference Bibles, and one of the distinctive factors of the Scofield Bible is that it is dispensational. Therefore those pastors hit on the scheme of attacking dispensationalism as a heresy. Because most people did not have clearly in mind what dispensationalism involved theologically, this tactic helped protect those pastors from questions about their own theology and it put those in the pew on the defensive. Conservative amillenarians saw an opportunity to further their cause, and they attacked dispensationalism as a departure from the Protestant Reformation. Their motto was “Back to the Reformation” as the cure for apostasy. The Reformation, however, did not deal with the subject of dispensationalism. So these theologians went back to Augustine and his amillennial eschatology. In the ensuing controversy many liberals attacked dispensationalism. But what they were really attacking was fundamentalism, premillennialism, pretribulationism, and the inerrancy of the Bible. In the process, liberals wrongly identified “dispensationalism” with fundamentalism. Characteristic of the attacks on dispensationalism is that its opponents say it is heretical. Their approach is often characterized by prejudice and ignorance rather than careful study of the Scriptures and of the history of dispensational thought. When amillenarian ministers are asked, “What is wrong with dispensationalism?” many of them cannot give an acceptable answer. The widespread prejudice and ignorance of the meaning of dispensationalism was illustrated when I was asked by a prominent Christian publication to write an article on dispensational premillennialism. In my manuscript I referred to The Divine Economy, written in 1687, in which the author, Pierre Poiret (1646-1719), discussed seven dispensations.4 The editor omitted this from the manuscript, and when I protested, he said, “That is impossible because John Nelson Darby invented dispensationalism.” It would be difficult to find a statement more ignorant and more prejudicial that that. A most important contribution to the discussion of dispensationalism was written by Charles C. Ryrie in 1966. In his book Dispensationalism Today  he answered many objections to dispensationalism. He presented the subject in such a proper biblical and historical light that for some years afterward the attacks on dispensationalism were muted. After several years, however, those who objected to dispensationalism thought it possible to ignore this work. But in 1995 he issued a revised and expanded work entitled Dispensationalism. This work will undoubtedly be unsurpassed by any work on the subject for years to come. Ryrie deals directly with the question of whether dispensationalism is a heresy, and he has a lengthy section on the origin of dispensationalism. He also discusses the hermeneutics of dispensationalism, the doctrine of salvation, the doctrine of the church, eschatology, progressive dispensationalism, covenant theology, and ultradispensationalism. The fact that the Bible uses the word “dispensation” as a theological term only a few times is no problem. Theologians use the words “atonement” and “Trinity” even though these words do not occur in the New Testament. As noted earlier, only three dispensations are discussed extensively in the Scriptures—the Law, grace (church), and the kingdom (the millennium)—though others are indicated in the Scriptures. For example The Scofield Reference Bible lists seven dispensations in the footnotes and then discusses each one subsequently in later footnotes. Wilmington, on the other hand, lists nine dispensations. Each dispensation includes requirements for human conduct. Some Bible students wrongly seek to apply prophecies of the future millennium to the present age. The progressive character of dispensationalism, however, means that it is wrong to bring prophecies of yet-future events and relate them to an earlier era. Nor is it proper to take elements of human conduct and responsibility from passages about Christ’s reign on earth in the millennium and apply them to today. Also a number of writers refer to passages on the Great Tribulation and its terrible disasters as if they will occur in the present dispensation of the church age. However, in the rapture the church will be taken out of the world before these events happen. A recent development in dispensational circles is called progressive dispensationalism. Advocates of this view hold that Jesus Christ is now partially fulfilling the Davidic Covenant, seated in heaven on David’s throne and ruling over His kingdom as the Messiah and King. I believe, however, that Jesus’ present ministry in heaven involves His intercessory work for believers as their great High Priest, and that His messianic rule is not occurring now but will occur in the millennium. Progressive dispensationalists do affirm, however, their belief that Christ will reign over Israel in His thousand-year rule on the earth. One of the best summaries of dispensations is found in the doctrinal statement of Dallas Theological Seminary. This states that dispensationalism is a form of stewardship or responsibility of humanity to obey God and to honor Him. Each dispensation recorded in the Bible ends in failure, thus proving that no one under any arrangement can achieve perfection or salvation. Even in the millennial kingdom, with its near-perfect circumstances, humanity will still fail. In every dispensation salvation is by grace through faith, made possible by the death of Christ. On the one hand the dispensations have diversity of requirements for human conduct, but on the other hand salvation is always by God’s grace. Salvation is the unifying factor in Scripture. It is most unfortunate that many people misunderstand dispensationalism. Even many of those who are dispensationalists tend to avoid using the term “dispensationalism” because it is often misunderstood. Those who claim that they are not dispensationalists are actually rejecting the wrong view of dispensationalism. For everyone is a dispensationalist—to a degree—whether he or she recognizes it or not. 1 Charles Hodge, Systematic Theology (New York: Scribner’s Son, 1857), 2:373-77. 2 L. Berkhof, Systematic Theology (Grand Rapids: Eerdmans, 1953), 293-301. Also Anthony A. Hoekema, an amillenarian who argues against dispensationalism, speaks of the Old Testament as “the period of shadows and types” and of the New Testament as “the period of fulfillment,” thereby acknowledging at least two eras of human history (The Bible and the Future [Grand Rapids: Eerdmans, 1979], 195). 3 For example the General Assembly of the Presbyterian Church in the United States stated that dispensationalism is “evil and subversive” (A Digest of the Acts and Proceedings of the General Assembly of the Presbyterian Church in the United States 1861-1965 [Atlanta: Office of the General Assembly, 1966], 50; see also 45-49). While this accusation was made several decades ago, that general attitude still prevails among many covenant theologians. 4 Pierre Poiret, The Divine Economy, 7 vols. (1687; reprint, London: R. Bonwicke, 1713). The seven dispensations he taught are Creation to the Deluge, the Deluge to Moses, Moses to the Prophets, the Prophets to Christ, Manhood and Old Age, the Christian Era, and Renovation of All Things. 5 John Edwards, A Compleat History or Survey of All the Dispensations and Methods of Religion, 2 vols. (n. p.: Daniel Brown, 1699). 6 Isaac Watts, The Works of the Reverend and Learned Isaac Waats (Leeds, UK: Edward Bainer, 1800), 1:555-65; 2:626-60. Both Edwards and Watts discussed six dispensations: Innocency, Adamical, Noahical, Abrahamical, Mosaical, and Christian. 7 Charles C. Ryrie, Dispensationalism Today (Chicago: Moody, 1966). 8 Charles C. Ryrie, Dispensationalism (Chicago: Moody, 1995). 10 Ibid., 27 (italics his). 12 However, not all premillenarians accept dispensationalism as a system. 13 C. I. Scofield, ed., The New Scofield Reference Bible (New York: Oxford University Press, 1967), 3. See also Stanley D. Toussaint, “A Biblical Defense of Dispensationalism,” in Walvoord: A Tribute, ed. Donald K. Campbell (Chicago: Moody, 1982), 81-91; and Ryrie, Dispensationalism, 51-57. 14 H. L. Wilmington, Book of Bible Lists (Wheaton, IL: Tyndale, 1987). 15 Craig A. Blaising and Darrell L. Bock, eds., Dispensationalism, Israel and the Church (Grand Rapids: Zondervan, 1992); Craig A. Blaising and Darrell L. Bock, Progressive Dispensationalism (Wheaton, IL: Victor, 1993); and Robert L. Saucy, The Case for Progressive Dispensationalism (Grand Rapids: Zondervan, 1993). 16 We Believe: Doctrinal Statement of Dallas Theological Seminary (Dallas: Dallas Theological Seminary, n.d.), Article V.